Play Mega Man Showdown IV online with Nintendo NES browser emulation for free! Mega Man Showdown IV is a rom hack of Mega Man 4 (NES). Play it with our flash, java and rgr plugin emulators. Nothing to configure, we've done it for you! Boss Rush mode for Mega Man IV. I finally win.. kneel to me, Wily. Toad Man Sitting in his place. Mega Man 4 is one of my favorite Mega Man games in the NES line. The original Mega Man 4 was very popular and a huge hit for capcom released around 1991. It should be no surprise that they are lots of hacks of this game. 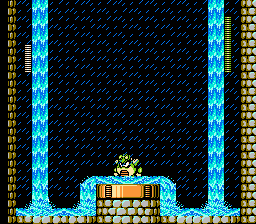 Mega Man IV showdown is a different type of hack. In this hack there are no stages as you fight the bosses directly in a showdown. How does this game compare to the original game and other hacks? Well, lets find out. The story is similar to the original game. However, there have been a few changes to fit this style of game. Dr. Light and Dr. Wily create robots to help mankind. Light, creates to lab robots Rock and Roll. 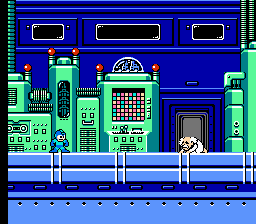 One day Wily takes the other robots and tries to take over the world. Rock having a sense of justice volunteers to become the fighting robot Mega Man. Mega Man has shattered Dr. Wily's plans 3 times. 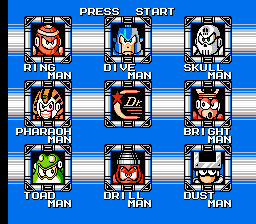 However this time a new scientists named Dr. Cossack has built new robot masters to challenge Mega Man in a duel. Who is Dr. Cossack, is he really evil or is Wily pulling strings again? Mega Man sets to fight the robot masters and get to the bottom of this. Okay, the original game had an awesome plot. Mega Man 4 added suspense and mystery to it. The only difference here is Mega Man has been directly challenged to a duel. In the original game and other hacks he sets out to get to the bottom of this. I really had no problem with the maker changing the plot to fit this game's style. The plot is pretty close to the original game. Therefore, I give it a 9 out of 10. The Graphics and Controls was hard for me to rate. Mainly because they are not a lot stages in this game. 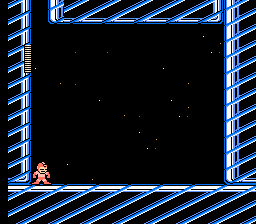 Mega Man 4 had some of the best graphics for the NES in my opinion. The color scheme, backgrounds, sprites and animation was done very well. It was just special how the original game was done. The stages have been eliminated in this game. So I could not rate the graphics and controls based on the stages. Instead I rated the graphics on how the intro rooms and boss rooms look. The intro and boss rooms where nicely done. I like the colors for the most part they were left unchanged. The sprites where nicely done as well. The controls for the most part are decent. The only issue is there are a few lags when fighting the bosses. The original game did not have lags. I wonder if that is due to the maker cutting off the stages. The good news is these lags are minor. Mega Man controls nice. Moreover, the controls are not as sharp as the original game but decent. Thus, I give the graphics and controls an 8 out of 10. This game offers something new. It reminds me of another popular Capcom franchise Street Fighter. Another game it reminds me of is the two Mega Man power battle games. The reason is you are fighting the robot masters in their boss room with no stages. On the other hand, I kind of miss the stages. I guess I am just an old school gamer. I did have fun playing this game as I stated it reminded me of street fighter. I liked fighting the robot masters in a duel. So if you want to skip the stages this game is for you. If you would like to have a street fighter mode in a Mega Man this is as close as it gets. If Mega Man Showdown IV suffers the most it is in the depth department. The original game had a lot of depth to it. In the original game there was secret items to find, secret paths to explore, long stages, and a lot of the stages require a revisit. This game has none of that in it. As the game implies you do not go through stages you go directly to an intro room then a boss. Some of the intro rooms do have power ups in them. Also they are a lot of bosses in this game so it will take some time. But other than that this game does not have the depth that Mega Man games are infamous for. I did not figure there would be a lot of depth in a hack like this. But it would have been nice if the maker kept a few of the things. I hate to do this but I really cannot give the depth a higher rating than a 2. The high number of bosses keeps me from giving this a 0 or a 1. This game was actually more difficult than I thought it would be. Now you make me asking and wondering how can a game be difficult when there are no stages? Well it is difficult for several reasons. First of all Mega Man's life bar has been reduced to about 60% of what it is in regular Mega Man games. This means you cannot afford to get hit that much. It should be noted there are not any power ups to increase your life bar in this game. I do not remember seeing any energy tanks either. Second, the robot masters speed and attacks have been increased. 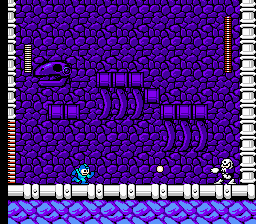 In addition the bosses attacks hurt a lot more than they do in the original Mega Man 4. Also the boss layout rooms have been altered. This actually gives the bosses an edge as it requires skill, reflexes, timing and luck to beat a boss. Another way the game is difficult is you do not have many lives in this game. If you lose a fight its game over similar to street fighter as well as the Power Battle games you have to continue to start the boss battle over again. The good thing is when you hit continue the game remembers who you have defeated. While this game is difficult I feel like I can't give it a 10 out of 10. The main reason is there are no stages. However, this game is difficult for the reasons I mentioned above. I will be honest I like this type of difficulty in a game. I think the game is difficult for the right reasons. Sometimes games are difficult for the wrong reasons such as glitches, sloppy graphics, sloppy controls, and etc. The lags I mentioned are minor and have really no impact in this game. To beat this game requires skill, timing, reflexes, and luck to beat. That is what makes a difficult game enjoyable. Therefore, I give the game a very solid 9 out of 10 in terms of difficulty. This game was certainly different from the original game as well as other hacks. I felt like this game was trying to offer something new to players. This game has some things going for it. The first being I kind of like the boss battle gimmick in this game. As I stated it reminds me so much of Street Fighter. It also reminds me of the two Mega Man Power Battle games. In the Power Battle games Mega Man fights robot masters in similar fashion. I wonder if that is what the maker of this game was aiming at. It is like the maker was trying to take a popular Mega Man game and make it into a fighting game. One could argue the maker was trying to make the Power Battle games into an NES game. . I also like the boss layouts to me that adds good difficulty as I call it. In addition, I really like how the story, and sound was left unchanged. The graphics where not as sharp as the original game but they were nicely done. Anyway, I had fun playing this game as it seemed different. Now, I'm not sure how I feel about the lack of stages. The lack of stages fits the showdown gimmick in this game. On the other hand I'm an old school gamer so I would have preferred to have stages even if they where short. Besides stages would have gave me and other old school gamers more time to listen to the amazing music. I also do not like how the depth has been cut way down. Even if the maker did not want stages. The maker could have included secret rooms in the intro room for the player to get. Mega Man games have a lot of depth to them so I was disappointed to see that done away with. Also while it is minor the lags do occur a few times in boss fights. The good news is they make no difference in the boss battles, but they are still present. These are the negatives in this game. To some gamers these negatives would not matter. Despite the games negatives this game has a lot going for it and I actually enjoyed it. As I mentioned a lot of players would not be bothered by the lack of stages and depth. The game certainly offers something new to Mega Man 4. I had fun playing and it is a game I certainly will play again. Would I recommend this game? I would recommend this game the following groups of people: Novice Mega Man players, Street Fighter players, and Mega Man fans. 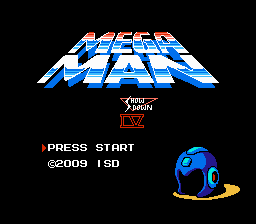 This game is difficult so this is probably not a game you would want to introduce somebody to Mega Man too. Also if you are familiar wiith Street Fighter games or fighting games such as the Power Battle Games you will probably enjoy this game. If you just enjoy Mega Man games and are a fan of the series then by all means play this game. However, if you are a new player I recommend you play the original Mega Man 4 before tackling this one. The original Mega Man 4 will get one used to the controls and boss fights. I also recommend you play Street Fighter II. Another game I highly recommend before playing this game is the 2 Power Battle Games. The Power Battle games are very similar to this game and would get one adjusted to playing this type of game. In Conclusion, I think this is a great addition to the Mega Man 4 hacks. It is a fun and good hack to play. I give the game a solid 8.4 rating. Anyway this concludes my review of Mega Man 4 Showdown. I hope you enjoy this game like I did. Blessings in Christ and happy gaming. 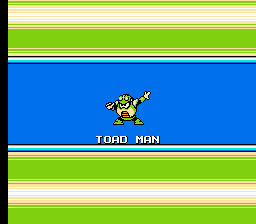 Toad Man was like the easiest boss to beat in the original MM4. But with no extra lives and half health, it's just making it hard and annoying! Rain Flush doesnt work against Bright Man, Agggghhhhhh! dust man's pattern was easy! For the record, having no extra lives does not make the game any more challenging when you have unlimited continues. It just makes things annoying. Ikr. I hate having half HP.